I offer a wide and varied selection of memorials, for either burial or cremation. 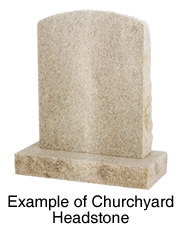 These range from the most elaborate headstone and kerbs, a plain chuchyard headstone, through to a simple flower vase. There may be certain burial authority regulations to follow, to which I will advice and guide to as to what materials and finishes are permitted, and what materials are suitable to make your require memorial.